Strengthen your balance, posture, flexibility, discipline, and coordination. Learn useful means to relieve stress, and test your skills at competition! Howard HaoPh.D. Traditional Chinese Sports from Beijing Sport University. Howard Hao has been teaching Martial Arts at The Beijing Center for Chinese Studies (TBC) since 2002. He has developed a completely new and systematic method on teaching martial arts. 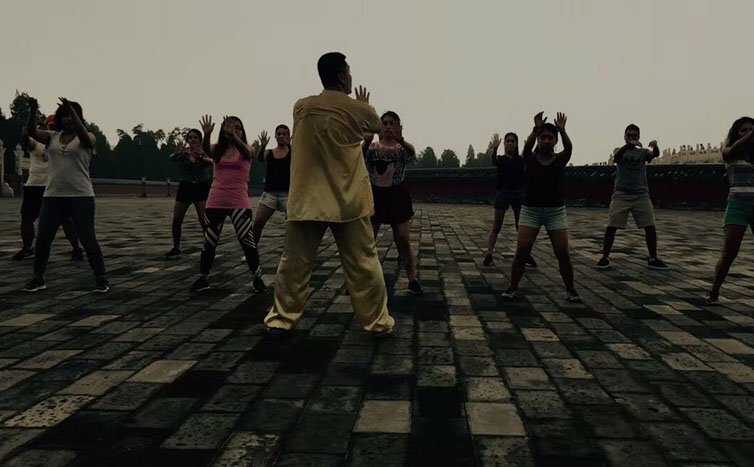 This course introduces students to Chinese Wushu (martial arts), which is a representation of the broad and profound subject of traditional Chinese body culture. The different styles of Chinese Wushu are so numerous that no one could learn all of them. For this class, two forms from two styles of Wushu have been selected for the students to learn, one is 24-Movement Yang Style Taiji, which incorporates traditional Chinese culture, philosophy and thoughts, the other is Xingyiquan (Body- mind Boxing), which is one of the major “internal”styles of Chinese martial arts. To encourage students to perfect the forms, a competition or a public show is required for students to attend. Also, to help students learn more about Chinese culture as related to Wushu, a written paper will be assigned as a mid-term exam. Attain a level of experience and competence so as to be able to compete and show in public.